4.2 out of 5 based on 58 bloggers and 6 commenters. 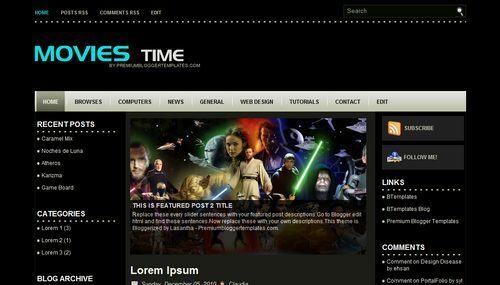 Movies Time is a free blogger template adapted from WordPress with 3 columns, magazine-styled, left and right sidebars, ads ready, slider and posts thumbnails. how do i change the size of the fonts (body font, post font, etc.) also how can i delete the time and date when the post was posted, along w/ the username? pls reply!!! also I don’t want the “read more” portion in the post I want the whole post to show instead. how can i change that?? Nice & cool template!! I wanna set my own photo slideshow on top of center column. Is this possible!?? How do I change it. please answer.